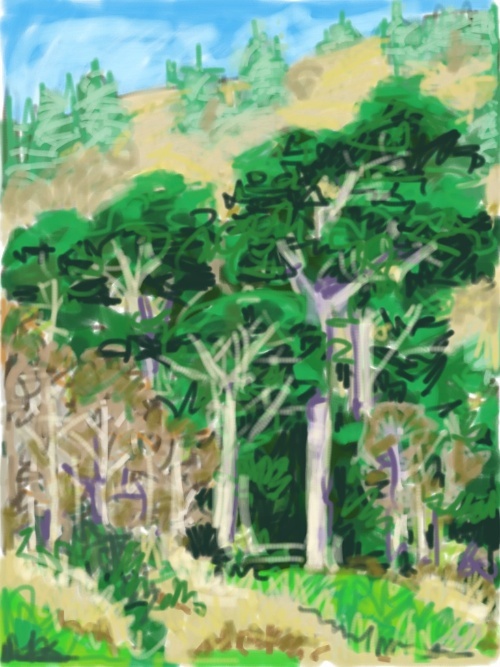 The iPad As A Digital Sketchbook….A Big WIN! But Not Epic. Yet. I’ve had my iPad for about three weeks and am already wondering how I got along without it. It’s easy for me to read on it and I’ve downloaded my first book, Isaac Asimov’s Memoirs, if you must know. I’ve played to the end of Graffiti Ball. I’ve got Solitaire, Cro-Mag Race and Paper Toss. David and I have found that we like playing Scrabble with it. I’ve downloaded the iPad version of the Monglian language app that I have on the iPhone and also found a English-Mongolian dictionary. Google Earth looks really good. I plan to use Keynote for a virtual portfolio of my work and a presentation about the women’s crafts collective that I work with in Mongolia. The battery life is terrific. The glossy screen is lovely. The keyboard, well, it’s functional, but will take some getting used to. I wouldn’t write the Great American Novel with it, but would certainly do short blog posts or longish emails. But, I wondered, having bought Autodesk’s Sketchbook for the iPhone, could I use the iPad as a real, functional, I just need to get some work done, sketchbook? 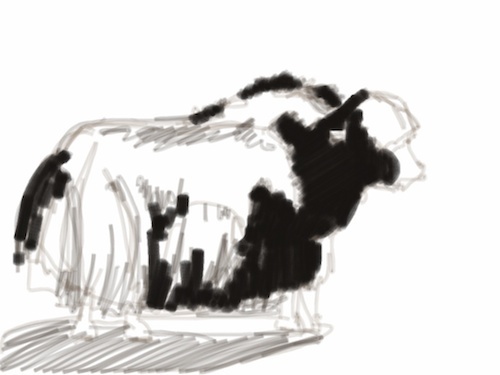 I bought Sketchbook Pro first thing. With some caveats, which I will cover at the end, the answer is a resounding “YES!! !” I had to force myself to stop drawing and get this post done. The iPad should be viewed as simply another way to create images. A different media, if you will. And one that takes the same kind of futzing around, experimenting and practice that would be required to get the hang of any new way of working. Except that it’s a whole bunch of ways in one app that can be endlessly combined. I’ve barely scratched the surface as this point, but thought that I would share some of what I’ve drawn and “painted” over the last week or so. I first had to decide what tool to draw with and what color. 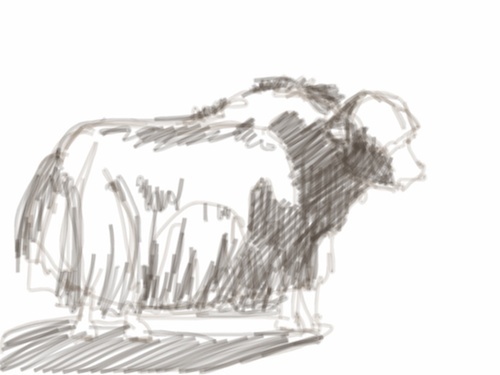 I decided to see if I could replicate David Rankin’s fast sketching technique because, if I could, then the iPad would be all I would need for field sketching at zoos and such. Here’s some experiments, the ones I considered reasonably successful. The others have gone to the big wastebasket in teh interwebs. These next ones are all done really fast. Maybe a minute or so. I like this one. Used a chisel point for thick and thin lines. My thought here was to see if I could do a prelimary quick sketch for a painting. 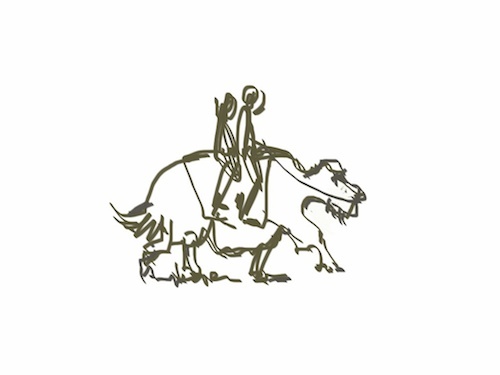 Two guys riding a yak. 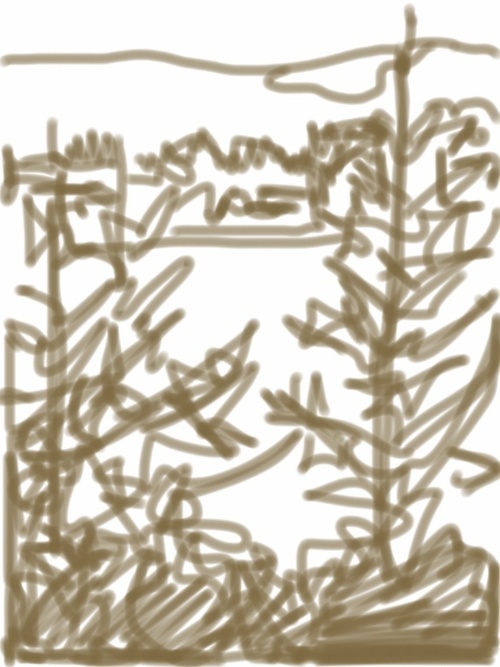 Then we went to the Humboldt Bay National Wildlife Refuge and I took the iPad with me. I realized that I didn’t know it well enough to do much, but I did do this one sketch that turned out ok. It’s from up on Table Bluff looking east across the bay. When we got home I decided to try something finished in full color from a photo I’d taken that day. I beat this thing to death adding layer after layer and, you know what, it didn’t matter. I could just keep going as long as I wanted to. So I had a scribbling good time on that one. 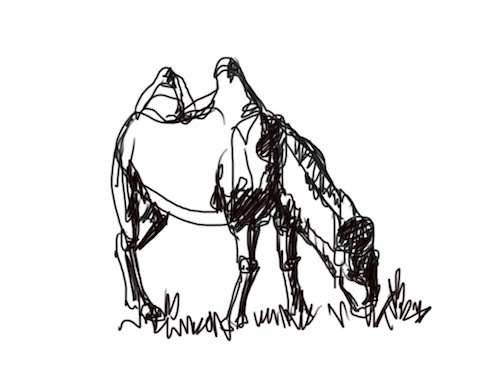 But how about a “real” drawing of an animal. A couple of false starts, I did the lemur and realized that this app was for real. It probably took me somewhat over an hour because of picking my way through all the choices of tool and colors. At this point, I also started to really use the “Radius” setting, which is the diameter of the tool and “Opacity” which is how solid the color is. And that function is what really makes this go for me more than anything else, I think. 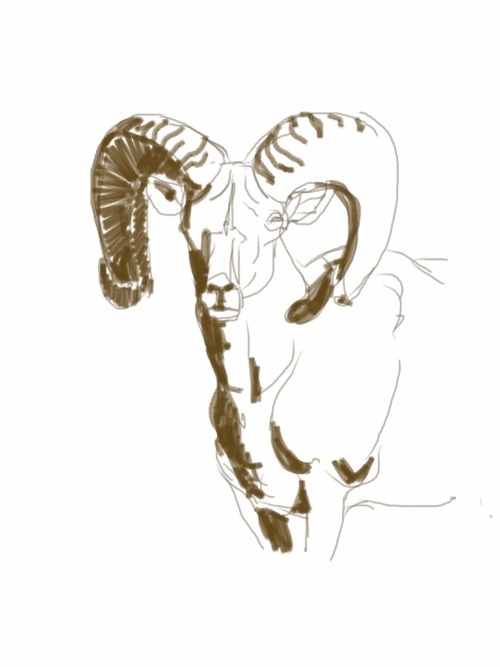 I started an argali drawing, got it almost done, leaned forward, accidentally pushed the button at the bottom of the iPad, which closed the app, unfortunately having not saved about an hour’s worth of work. All gone. Oops. Lesson learned. But here’s the starting drawing, which is pretty much the same as what I do with a brush or pencil. 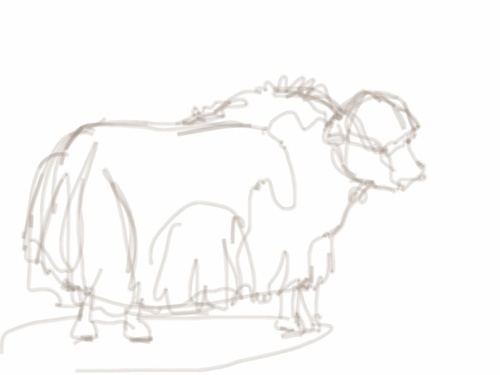 Start of argali drawing; and the end, as it turned out. This morning I did the following drawing of a yak, wanting to have something more finished to go with the lemur. I did my saves this time, so I can show you the whole sequence from start to finish. It took about an hour and a half. I used the same procedure as usual. Thought I was done and, anyway, it was lunchtime. But came back and realized that the highlights on the hide were too bright. I could keep going on this guy, smoothing the transitions between areas and doing more with the ground, but I’ve gotten all I need from this one, so time to move on. It was fun though, especially adding the squiggles on the head. 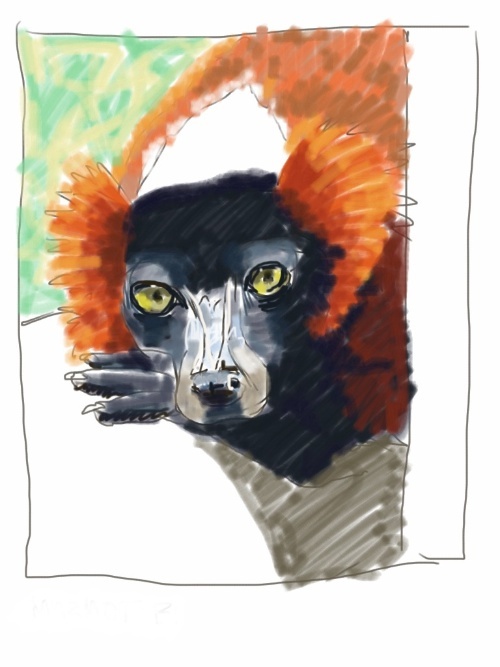 The first eight drawings, up to the lemur, were done with my finger. I was surprised at what a decent result I got, but I needed something with finer control and which was a wee bit thinner because said finger blocked my view of what I was working on. We went by the local Apple affiliate store and I bought a Ten One Design Pogo Sketch because….it was the only stylus they had. As it turned out, it works pretty well. But I would still like something with a smaller tip. There doesn’t seem to be anything out there at the moment. The stylus tips have to be a special kind of foam that will conduct electricity, which is how the touch screens work. There is some DIY info. on the web that shows you how to make your own and I’m thinking I might try that. Moving the foam tip around on the screen doesn’t have a great tactile quality. It’s kind of smooshy and draggy. And I wonder how long the foam will hold up with the kind of use I intend to give it. I still need to put a removable clear film on the screen, so maybe I can find something that is slicker. Someone needs to make a special clear film for artists that has the right amount of friction. 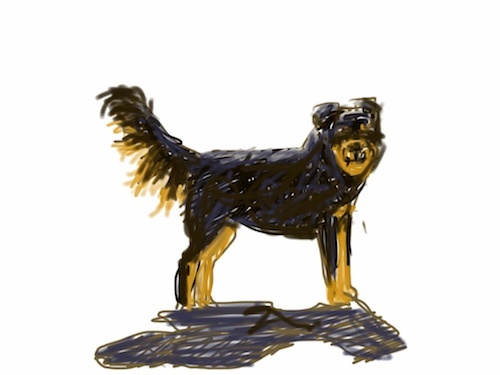 Overall the functionality of Sketchbook Pro is really good and pretty intuitive. I’ve read the documentation and don’t recall seeing any of these addressed: I would like to have a side bar, like in Photoshop, that let’s me keep the tools and color selector in view. Having to toggle back and forth can get a little old. But it does give one the maximum real estate for drawing. I’d like an auto-save option (imagine that) that can be set to a choice of intervals. I want an eraser. Right now, I have to change colors and select white to erase. I’d like to be able to directly import all or a selection of drawings into Aperture without having to export them to Photos on the iPad first. 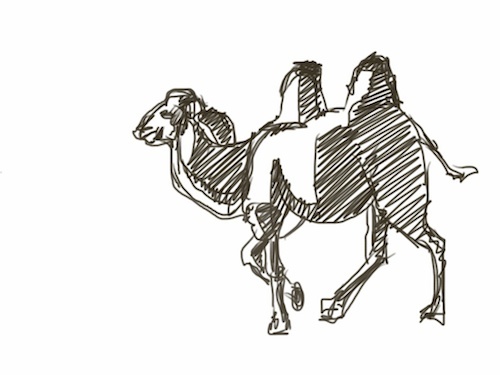 But the whole process was easy and worked well, except for the part where every image was re-named “Susan on the camel.jpg” (a previous project) when I exported them to my blog folder instead of the names I took the time to give each drawing in Sketchbook. Aperture also insisted on creating a new Project for the images instead of letting me import them into the album I had created for them. The two apps need to learn to communicate better. I’d like the images to be in a format other than jpg so that I can process them in Photoshop if I want to without losing image quality. I would like to be able to access the user manual in one click. The combination of the iPad and Sketchbook Pro is very close to being a serious product for serious working fine artists. I absolutely recommend it. I am trying to patiently wait for the next generation, which may be April this year…..
My only question becomes: does this mean we are doing digital art when using the iPad Sketchbook Pro??? That’s an interesting question, isn’t it? Because “digital art” is expressly disqualified from many, if not most, fine art competitions and shows. That may have to change over time. To me, image making this way is just a different media. What matters is if it is good art or bad art, not how it was produced. I have to say, I’ve fallen heads over heals for this program. 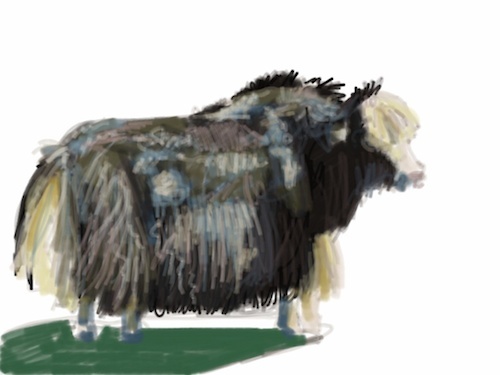 I started out with the 3 year student trial of Sketchbook Pro 2011 on my PC, which I still have and it’s really nice. Actually, it started out on Sketchbook Mobile on my iPod touch, and it’s a very great painting and sketching application. Then I saw this could be used with a tablet, and I thought I could see if I could look into getting this. Since the 3 year trial, it has become my digital sketchbook. I actually prefer drawing on here than on Photoshop CS5 because it feels more natural and it’s snappy and starts up fast! 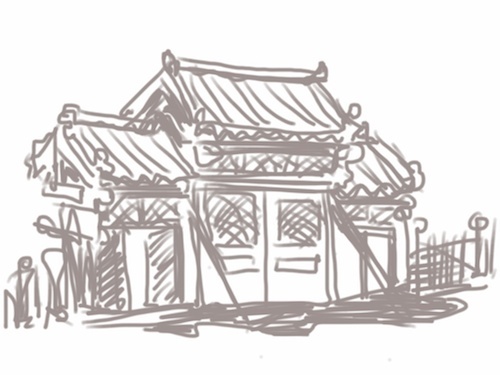 I would use Photoshop just to polish the sketch I would use in this application. This application runs great on my Windows 7 laptop like a dream. I then got the update for the Mac app store on my old MacBook. It was a hand-me-down from my sister, and yes, it’s the oldest one with the Intel Core Duo, the one right after the iBooks and PowerBooks. I saw this thing on sale for 30 bucks and I couldn’t pass this opportunity up. So, a few days later, I got an iTunes card that was compatible with the Mac App store and got the application. Despite my MacBook being the oldest model, it runs great!! Even if it’s just 1GB of RAM, it runs smoothly. For Mac users out there, take advantage of this price for your Mac. I recommend this application. And if you don’t have a tablet, you can use an application called Inklet to use which turns your MacBook or MacBook Pro’s trackpad into a graphics tablet, depending on the model. Go to tenonedesign.com for more info. Sorry for rambling on about that! I thought it was informative. It works well with tablets like the Wacom Intuos4 and I imagine works better on tablet PCs and pen monitors like the Wacom Cintiq. 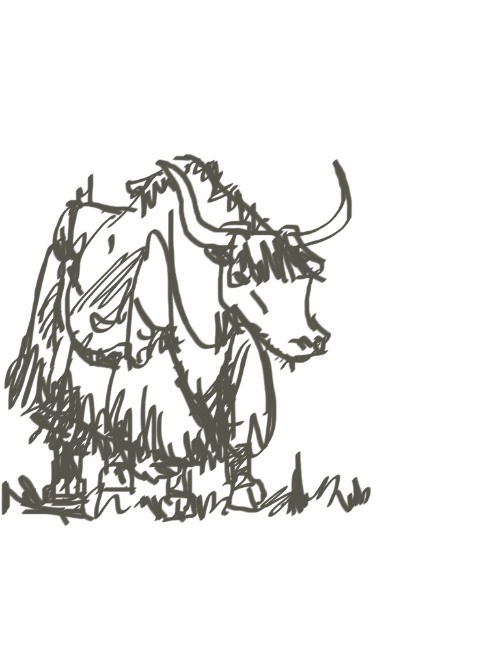 Try the free trial and you’ll find this application to be worth buying on either Mac or PC =) Happy sketching!